Originally managed by the Eastern Tennessee Power Company, the Ocoee River was dammed to build hydroelectric plants. The Ocoee No. 1 and Ocoee No. 2 Dams were built between 1910 and 1913 featuring a wooden flume that diverted the waters of the Upper and Middle Ocoee along an elevated path, concentrating water pressure for the hydroelectric powerhouses. The Tennessee Valley Authority (TVA) purchased the power system in 1939, and in September 1976, the wooden flume diverting water on the Middle Ocoee was shut down for reconstruction and, once again, the river ran unabated. The river attracted lots of attention, as boaters flocked to the Middle Ocoee to run its five miles of continuous whitewater rapids. Rafting companies sprang up while the TVA hurried to repair the flume and again divert water from the Ocoee. After much resistance and a Congressional Act, TVA agreed to schedule 116 days of recreational whitewater releases per year on the Middle Ocoee. 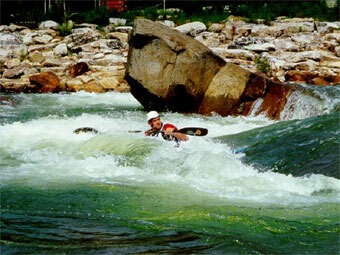 Whitewater racing events have been held on the Ocoee since 1978, bringing the river to the attention of the world. The Ocoee has also been called the birthplace of freestyle kayaking, hosting the first-ever Ocoee Rodeo at Second Helping in 1983. The Ocoee has become one of the most popular whitewater rivers in the world, attracting over 250,000 visitors annually. The Upper Ocoee riverbed had remained dry throughout most of the 20th century, which allowed for the manipulation and construction of a world-class racing course. The Ocoee Gorge is wider at this point, allowing ample room for spectators. With the Ocoee approximately 100 miles north of Atlanta, all three of these factors made the Upper Ocoee the ideal place to host the 1996 Summer Olympics Whitewater Slalom competition. The Ocoee would be the first natural river used for Olympic whitewater competition, but this upper stretch was shallow and too wide to generate the desired intensity for whitewater slalom. Course designers rechanneled the riverbed to create an Olympic course one-third the width of the original riverbed. To estimate the effects of this rechanneling, the design team used a 300-foot, 1:10-scale physical model for calculation purposes, and to minimize the time and cost for experimental boulder placement, the amout of water required for full-scale testing, and disruption to the river. Sandstone boulders harvested from the area shaped the course banks and venue, some weighing up to seven tons each. The design team developed the concept to build a river within a river. They used levees or banks to create the narrow "inner" whitewater course. This allowed the "outer" river to be used for viewing areas during events and to convey high flows during floods. The project of rechanneling the original riverbed took less than two years to complete, and created what would soon be called "America's Olympic River." 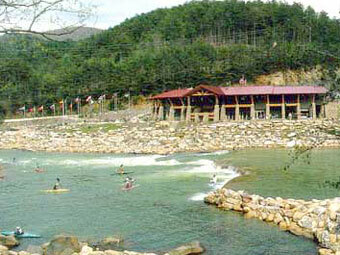 July 1996 brought over 15,000 visitors and more than 1,000 volunteers and staff to the banks of the Upper Ocoee River. River Description: The first stretch of the Upper Ocoee is primarily Class II tree dodging. Much of the riverbed is cluttered with low-lying bushes and dimunitive trees, forming a maze of sorts. After a little less than a mile, you will reach the first major rapid below the put-in. The left channel is often called David's Pride, and features a double-drop into a pool. The right channel is called Tombstone and is recognizable by the large tombstone-shaped rock on the left side side of this channel. Either way, be sure to catch Dee Dee's Secret, the popular playspot with a marvelous surfing wave and two ledge-holes found directly below Tombstone. Dee Dee's Secret can be difficult to find, especially if you run David's Pride -- you will have to weave your way through the bushes on the right in order to find it. On and off Class II-III continues downstream until you reach the next major rapid, Mikey's. Mikey's is the largest rapid above the Olympic course, and can be scouted from the island in the middle of the river. You will see an island and a chute to the right. Rocks at the top split this chute, and make two moves possible here -- a right to left move above and around the rocks near the top of the drop, and a straight right-side line over the five foot ledge into the deep hole at the bottom. If you run left of the scouting island, you will find a four foot ledge with a nice boof move. The stretch from Mikey's, through the Olympic Course, to Roach Motel, will suprise most newcomers to the Upper, as it shows a tremendous strength and power not found on the Middle Ocoee. Blue Hole is the last rapid above race course. Start far right, then paddle left over the tight main drop into the large waves that continue downstream toward the bridge. Use caution . . . a rafter drowned in a sieve here. At the bottom of Blue Hole, you will notice a large suspension bridge signifying the start of the Olympic Course at the Ocoee Whitewater Center. The first drop after the suspension bridge is called Best Ledge, with a large tongue on river right. Best Ledge leads directly into Smiley Face, named for a smiling face spraypainted on one of the larger rocks in the middle of the rapid, visible only at low water. In fact, this is the only graffiti not removed from the riverbed in preparation for the Olympics. The hole is to the left of the rock right of center, and is the new home of the Ocoee Rodeo. After Smiley's, waves and eddies abound, leading directly into Slam Dunk - the biggest single drop on the course. Run the slot in the center and eddy out into one of the large eddies on either side. A wave train called Conveyor Belt leads into Callihan Ledge, a shallow ledge created as a rodeo spot and named for a spraypainted name on the rock ledge. Run to the left or right of the midstream shoal. Humongous is next. 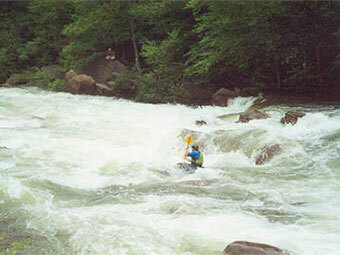 It is the largest rapid on the Upper Ocoee. The river constricts, forming a large wave train which is then split in two by a large rock with a television camera mount. The left side has eddies extending from the river left bank, while the right side features very small eddies and large waves that plunge into a violent hydraulic. There have been many bad swims on both sides of this rapid, including several during the Olympics. After Humongous (the last major rapid on the Olympic Course) go left under the bridge where Class II-III continues for several hundred yards. The river narrows and drops into three very large offset holes called Roach Motel. Stay right of center to avoid the strong middle hole. Be sure to avoid the numerous small bushes and trees growing in the riverbed from this point until the campground. After more paddling through bushes, you will be able to see the Thunder Rock bridge and the Ocoee #3 Powerhouse on the left. That signals the last major rapid on the Upper Ocoee, Edge-of-the-World. Just after the Thunder Rock Bridge, the river drops about four feet into a very large hydraulic. This drop is adjacent to the manmade outflow chute that releases the water for the Middle Ocoee from the Ocoee #3 Powerhouse. Edge-of-the-World will probably kick you to the left, upstream toward the turbines. This is one of the most dangerous spots on the Upper Ocoee because of the very large hydraulic forming at the base of the drop, especially at levels above 1800 CFS. If you don't know where to run this drop, visit the Thunder Rock campground before you go to the put-in. To skirt this drop, paddle down the Class I-II natural streambed on river right. The left side of the turbine chute, across from Edge-of-the-World, is reinforced with concrete. You want to run the drop directly across from the concreted-in section, and you don't want to miss the main slot. We'll always remember you, Stan. Saturday my son Jesse, Dave Beckner and myself removed all the wood from Alien Boof. We ran Alien on Saturday but the strainer did make it harder to run since it was right where we normally run Alien. There was quit a bit of wood piled up on the drop some pieces were 12 inches in diameter an 8 feet long. I will post some pictures of the wood before we removed it. AFTER 2001, TVA ANNOUNCES NO MORE FLOW FOR THE OCOEE RODEO! This is a dam release river that primarily runs on weekends March through October. Check the TVA release schedule for specific dates and times. Yell, Showing up the young punks! Drunk as sh** at O.A.R. Gordon Byrd running Dave's Pride Rapid on the Upper Ocoee River. A group of ladies started a discussion about the need for an all women's paddling event. Plans progressed and the Boater Chick Festival benefiting American Whitewater was born. This first annual festival is a gathering of female boaters in the class II-V whitewater range. The location will be at Nantahala Outdoor Center in Wesser, North Carolina on Saturday May 17th and Sunday May 18th. The hope is to encourage women in boating to get more involved, show off, improve their skills, meet other women in boating, paddle together, compete, and celebrate. TVA is gathering information from stakeholders on how to meet the needs of the Tennessee Valley and its residents for energy, environment, natural resource management and recreation. As users of public lands and waters, please tell TVA what you think. Please submit your comments by August 14, 2009. The agreements that provide recreational releases on the wildly popular Ocoee River expire at the end of 2018. American Whitewater has created a survey to help us better understand and advocate for the interests of paddlers as TVA reconsiders releases. If you paddle the Ocoee, please take 5 minutes to share your thoughts with us. A bill has been introduced in the Tennessee Legislature that aims to continue treasured recreational releases on the Ocoee River after current release agreements expire in March of 2019. The Ocoee River Recreation and Economic Development Fund Act would create a fund that would be used to pay the Tennessee Valley Authority for releases and to pay for other river management costs. Paddlers from TN can weigh in on the bill now, and all paddlers will have a chance to voice support or concerns with the TVA this spring or summer. TVA is seeking public input on a proposed management agreement that would provide recreational releases and management on the Ocoee River. Current agreements on flow releases and management expire at the end of 2018, and this effort aims to replace those agreements. The TVA proposes to continue the current schedule of releases on the Upper and Middle Ocoee except for a block of weekday Middle Ocoee releases in late September. The public comment period ends on July 19, 2017. Earlier today American Whitewater filed comments on the Tennessee Valley Authority's (TVA) proposal to largely maintain the existing whitewater release schedule for the next 15 years. American Whitewater asks TVA in our comments to ensure that no net loss in releases occur and that no new fees be imposed on private boaters. We ask that they study the economic benefit of the Ocoee River release program, as well as consider the benefits the releases are known to have on a rare plant species. Lastly, we ask them to consider improved takeout facilities on the Middle Ocoee River and expanded put-in parking hours on the Upper Ocoee. The Tennessee Valley Authority has decided to use water in its rivers for power generation rather than other beneficial uses, contrary to the result of analyses of all economic data and the interest of the public. Numbers of paddlers on the Ocoee have skyrocketed in recent years .Whitewater recreation and events deserve a fair share of the river's essential resource - the flow. 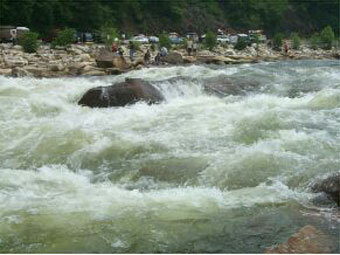 American Whitewater is mounting a effort on behalf of all whitewater paddlers to restore the Ocoee's flow!